If you used the search on this blog in the top right, you were directed to google site search, clicked hopefully on a hit and went back to my blog. From analytics, I knew that this is used more frequently than I thought - and I used it, too. Given the static nature of this blog, I could not simply hack some SQL queries together and pretend to have a search - I wanted “search-as-a-service” that I can put in the top right and just works. 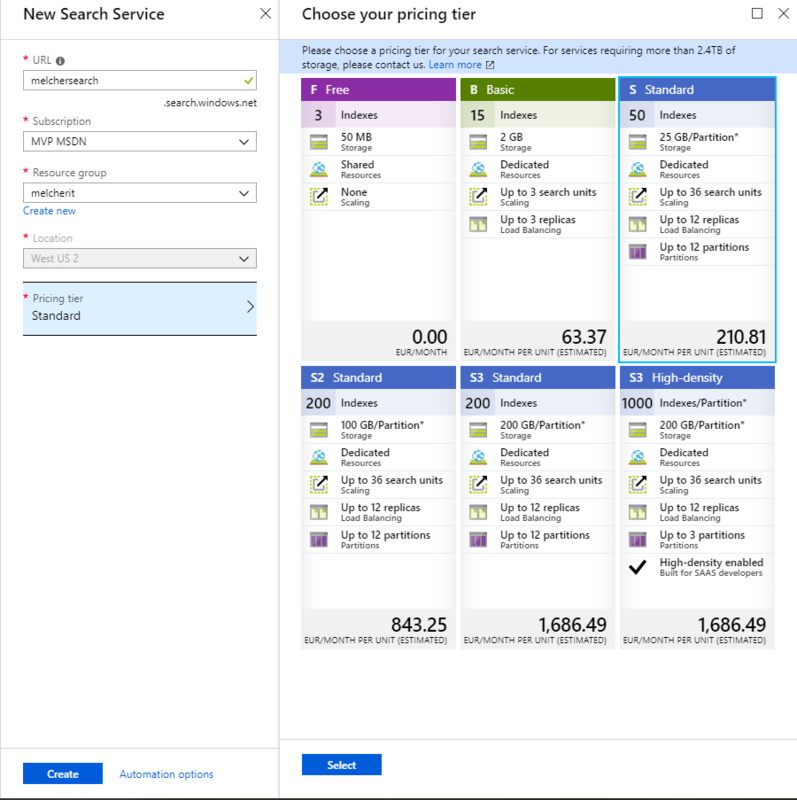 So I decided to use Azure Search as a search service - and the result blew me away! It is sooooo simple to get started - and surprisingly, it’s free! Some background: my blog is hosted on Azure Storage with Static Website feature enabled. Hugo generates pure HTML files upfront, they are then stored on the storage. No high-level runtime stuff available like PHP or ASP.net. In line 8 I configured that the output format JSON should be generated additionally to HTML and RSS. In line 1 I specified the JSON output further. Line 3 and 4 specifies where the JSON file is being placed, in my case /feed/feed.json (you can open that file, too). In line 2 I iterate over all my blog posts. And from line 5-15 I export all the fields that I want to have available in the search index. You can even add logic to the output with the GO template language (line 12); I noticed that I had blog posts with no images so I added a placeholder there. So we are set for indexing. No further manual step required once I craft a new post or update an existing one. Awesome. I selected the free tier, for my blog its more than sufficient. The important field here is “Parsing mode” - the JSON Feed we created above exports as JSON array, so select that. In the next dialog you can further optimize the extraction and add all kinds of cognitive service fields to your hits (people names, org names, etc. ), I skipped that for now. I removed all storage metadata and made all fields retrievable. The fields that have valuable fields, I made searchable and changed the Analyzer to “English - Microsoft”. 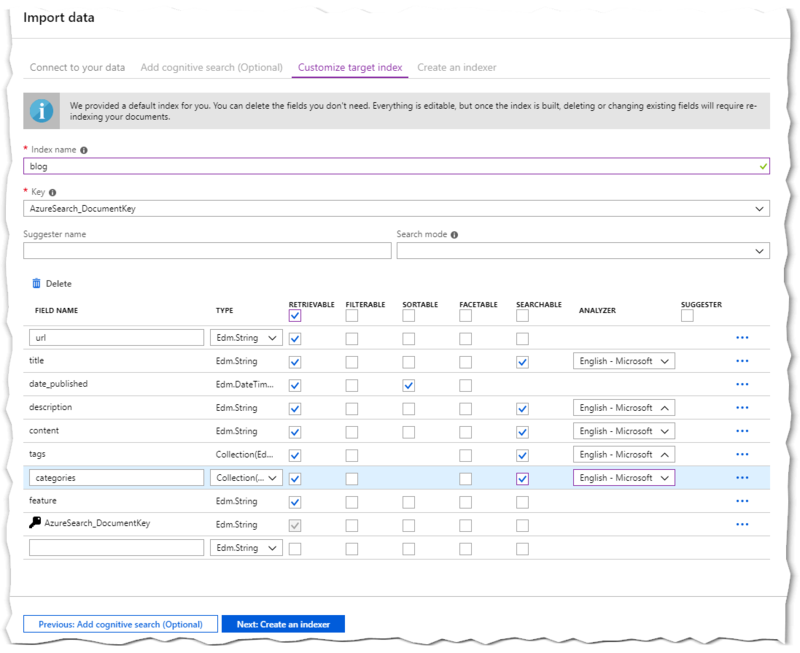 My content is in English and I heard good things about the indexer that Microsoft maintains. I want to start the indexing once I publish (automated, of course) and not every x hours. Immediately after creating the index, the content was already indexed - it’s super fast. For my ~500 pages that are indexed, it took 1.5 seconds. As you can see, I am using only 2.2% of the max index size of the free tier, I can use this service for free for a very long time! Great! Indexing all of this gives me a REST endpoint that I can use to fire queries against. E.g. 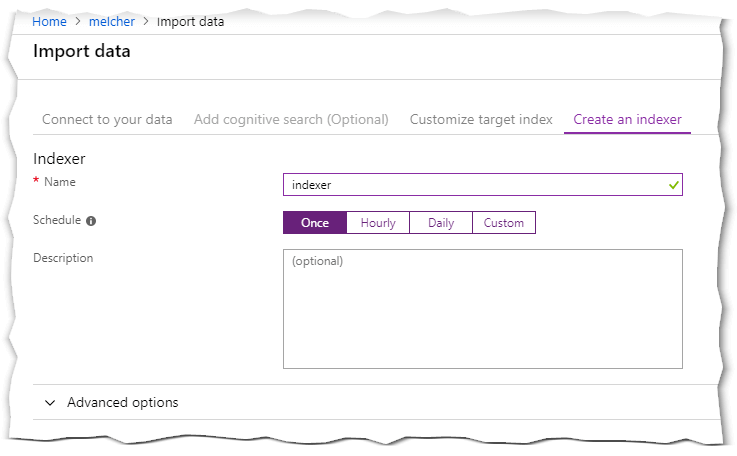 https://melcher.search.windows.net/indexes/blog/docs?api-version=2017-11-11&$top=10&search=azure&api-key=291A630E0DAB2D652ECDF845294E793E gives me the top 10 posts that have the keyword azure in it. Pretty straightforward to me. 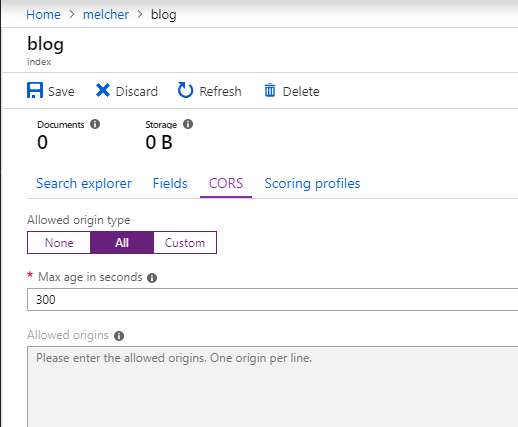 If you want to consume the search service via REST, you have to allow CORS. The option is “hidden” on the index. Access to XMLHttpRequest at ‘https://melcher.search.windows.net/indexes/blog/docs?api-version=2017-11-11&$top=10&search=azure&api-key=291A630E0DAB2D652ECDF845294E793E' from origin ‘http://localhost:1313' has been blocked by CORS policy: No ‘Access-Control-Allow-Origin’ header is present on the requested resource. Now comes the tough part for me. I need to build a UI to surface the search results. At first, I looked at a few jQuery widgets that promised autocomplete, search-as-you-type and what not. But actually, that was a lot of pain to make it work so I decided to build a simple UI myself with good old jQuery. Note I doubt, that you can just copy&paste my customization directly to your blog - but they hopefully give you an idea how I did it. Firstly, I added a template rendering library mustache.js to my footer. I need it to dynamically render the search result. Mustache has a pretty flexible template language and you can adjust the delimiter to not interfere with Hugo’s template language. It opens an overlay when you click on a button that has the class “fa-search”. 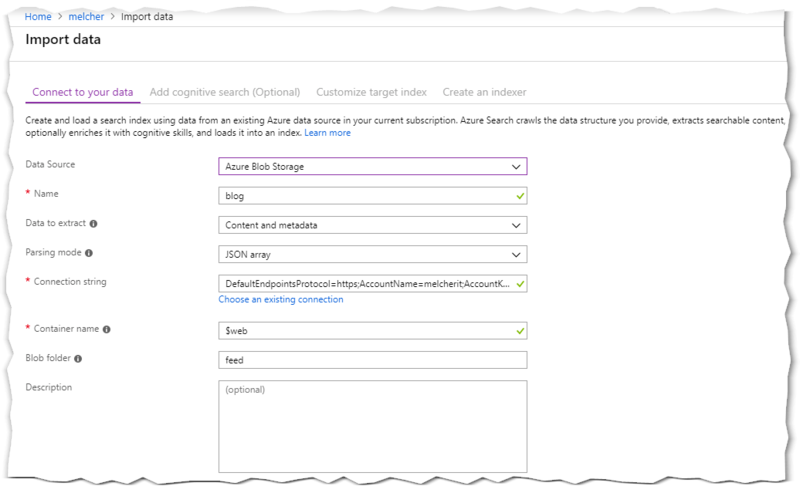 Search results provided by <a href="https://azure.microsoft.com/en-us/services/search/" target="_blank">Azure Search</a> - read how I built it <a href="https://melcher.dev/2019/03/AzureSearch-and-Hugo-free-and-awesome/">in this post</a>. It defines a block #overlay that has the input box and the close button. Additionally, it adds the mustache.js template that I use to render the results. The [[variable]] placeholders are then replaced with actual values. Ok, that’s it - I have the search that I wanted with all the flexibility that I need “as-a-service”. 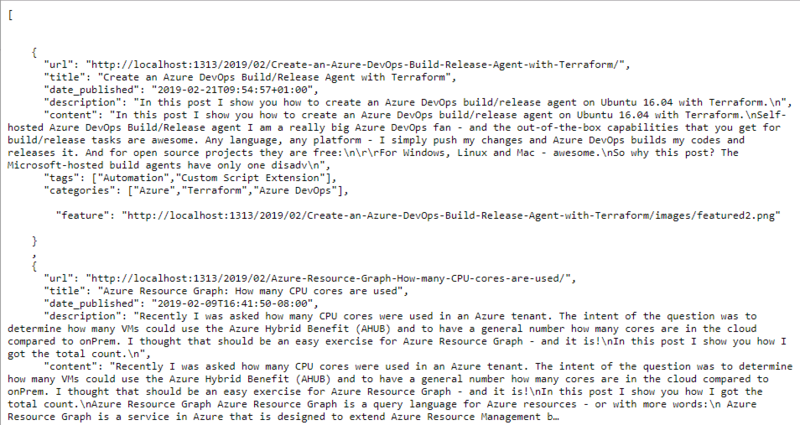 From an effort perspective, I took me 5 minutes to setup Azure Search. 30 minutes to teach Hugo how to export only the data that I need for search and approximately 2 hours for the UI. 2 hours 35 minutes of my life that I won’t get back - still, great learning expertise and I am a little proud of the output.